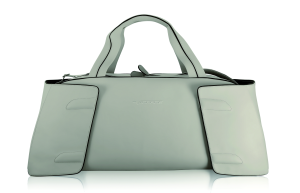 cyber-Wear left the competition trailing behind at the Promotional Gift Award 2017 in the category Custom-made Designs with a high-end travel bag it produced for Ford. The Ford Vignale Weekender features a timeless, urban-look design and reflects the luxurious vehicle extras, comfort, exclusivity and sophistication of the Ford Vignale models perfectly. Fine Italian leather, selected and processed by hand, lends the bag its visible and tangible luxurious quality. The trapezoidal contour picks up on the radiator grill of the Vignale models as a design element and the protruding side parts reflect the consistent design language of Ford – ingeniously adapted using small details such as the piping or the lining of the weekender, which picks up on the decorative pattern of the car seats. The model that has already been distinguished with an iF Design and the ABC Award was developed as part of a premium luggage collection by Ford Design and cyber-Wear hand-in-hand. The production is carried out by small manufacturing companies in Turkey. A personalisation, i.e. the initials of the purchaser, is possible on request.